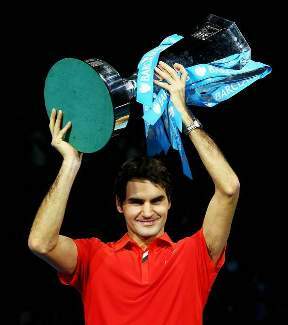 Roger Federer won the 2010 ATP World Tour title after defeating World no. 1 and arch-rival Rafael Nadal 6 - 3, 3 - 6, 6 - 1 at the O2 Arena in London. Federer ended an average-by-his-standard tennis season with a win the same way he opened it with a major title - the Australian Open grand slam crown in January. In between, he lost his grand-slam semis streak in the French Open, lost in the quarterfinals of his favorite Wimbledon, lost in the semis in the US Open and another finals lost to Nadal in the Madrid Masters in May. Even though Nadal is only his his first ATP world tour final played in hardcourts & needed to work harder to get past Andy Murray in the semis, Federer's great win in 2010 ATP World Tour finals displayed a fine form that can do wonders for Roger (and his confidence against Nadal) going to next season and aspiring to reclaim the no. 1 ranking in the Tennis world. 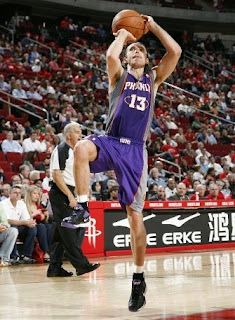 The Phoenix Suns defeated the Houston Rockets 123 - 116 in Houston bolstered by the return of its star and leader, Steve Nash, into action. Steve Nash did not played in the last two games because of a groin injury. His return is timely as he helped the Phoenix Suns stop its 3 game losing skid. He scored 24 points and dished out 9 assist. My Phoenix Suns is now again at .500 winning percentage (7-7) which in the ultra-competitive western conference hardly gets you into the postseason. * I hope the front office of the Phoenix Suns make a strong move unto signing serviceable big man Erick Dampier away from Miami to at least have a decent inside presence. * Phoenix Suns arch-nemesis San Antonio Spurs is looking like a serious contender for another title with its 10th straight win over another contender the Orlando Magic. 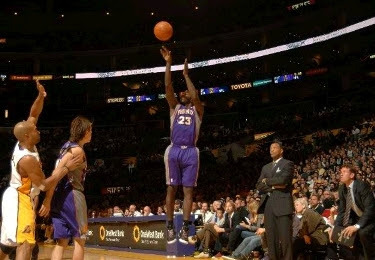 The Phoenix Suns shot 22 treys to offset the frontline of the Los Angeles Lakers for a 121 - 116 victory and hand the defending champs first lost at its home floor in the Staples Center for their fifth win in the NBA 2010 - 2011 season. Jason Richardson led the Suns in scoring with 34 points with 7 three-pointers, off-season acquisition Hedo Turkoglu had 5, Channing Frye had 4, Goran Dragic had 3, Steve Nash had 2 and Jared Dudley added one. The Phoenix Suns almost match the record 23 made treys set by the Orlando Magic. My sports weekend was great after Manny Pacquiao's facial drubbing of Antonio Margarito is followed by my Phoenix Suns returning the favor to the Lakers who already beat them at home this season. I know 22 of 40 will not be on a nightly basis but maybe this is the identity that my Suns can embrace specially that they do not have an inside presence. A run and (3 point) gun team. This is the first time that I noticed my Phoenix Suns move above the .500 mark in win percentage. I hope that beating the defending champs will boost their confidence and continue winning. 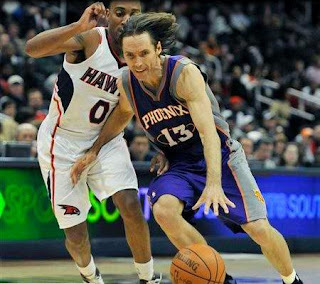 Steve Nash & the Phoenix Suns have dealt the Atlanta Hawks their first loss of the NBA Season 2010 - 2011 via a 118 - 114 win on the road. My Phoenix Suns had a balanced attack where 6 players scored in double figures to have their first win streak of the early NBA season and even their win-loss slate at 3 - 3. Jason Richardson led Phoenix with 21 while Captain Steve had 19 points & 15 assists, including four important endgame free throws to seal the win. The Atlanta Hawks started the season 6 - 0 and previously was the only undefeated Eastern conference team. Major offseason signee Joe Johnson led the Hawks with 34 points.